احمدی, حمید, خلیل طهماسبی, نوذر. (1397). قانون‌خواهی (شکل‌گیری مفهوم نظم) در اندیشۀ روشنفکران ایران سدۀ نوزدهم. فصلنامه علمی تخصصی سیاست پژوهی, 5(9), 113-145. حمید احمدی; نوذر خلیل طهماسبی. "قانون‌خواهی (شکل‌گیری مفهوم نظم) در اندیشۀ روشنفکران ایران سدۀ نوزدهم". فصلنامه علمی تخصصی سیاست پژوهی, 5, 9, 1397, 113-145. احمدی, حمید, خلیل طهماسبی, نوذر. (1397). 'قانون‌خواهی (شکل‌گیری مفهوم نظم) در اندیشۀ روشنفکران ایران سدۀ نوزدهم', فصلنامه علمی تخصصی سیاست پژوهی, 5(9), pp. 113-145. احمدی, حمید, خلیل طهماسبی, نوذر. قانون‌خواهی (شکل‌گیری مفهوم نظم) در اندیشۀ روشنفکران ایران سدۀ نوزدهم. فصلنامه علمی تخصصی سیاست پژوهی, 1397; 5(9): 113-145. بدین سان، ایدۀ محوری پژوهش این است که درک اندیشۀ سیاسی ایران سدۀ نوزدهم به ویژه گرایش متفکران به قانون و استقرار نظم، منوط به فهم زمانۀ روشنفکران و گفتمان مسلط بر جامعۀ ایران سدۀ نوزدهم است. زمانه­ای که متأثر از چالش­ها و مصائب درونی و آشنایی با جهان غرب بود، پرسش­هایی در اذهان روشنفکران ایرانی ایجاد نمود که عقب­ماندگی، کانون محوری این پرسش­ها بود و آنان هوشمندانه، مناسب­ترین پاسخ را در فقدان قانون خلاصه کردند. The events of 19th century in Iran brought many discussions into the country's political arena and new literature on Iranian land policy developed by intellectuals, tourists and transformative thinkers from which the most important and prominent has been little efforts to establish law and order in the country. The legal idea of one hand, is influenced by bad situation of Iran in the nineteenth century, and is created through Iran's analogy with the foreign countries in the thought of the intellectuals of that era on the other hand. This idea was mentioned by intellectuals as the only solution to provide public interests, transition from the crisis of Iran and salvation of failing Iran. The present article by analytical-descriptive method seeks to answer this main question what causes and motives led the Iranian elites and intellectuals to resort to the law as a remedy for chronic pain in the land? 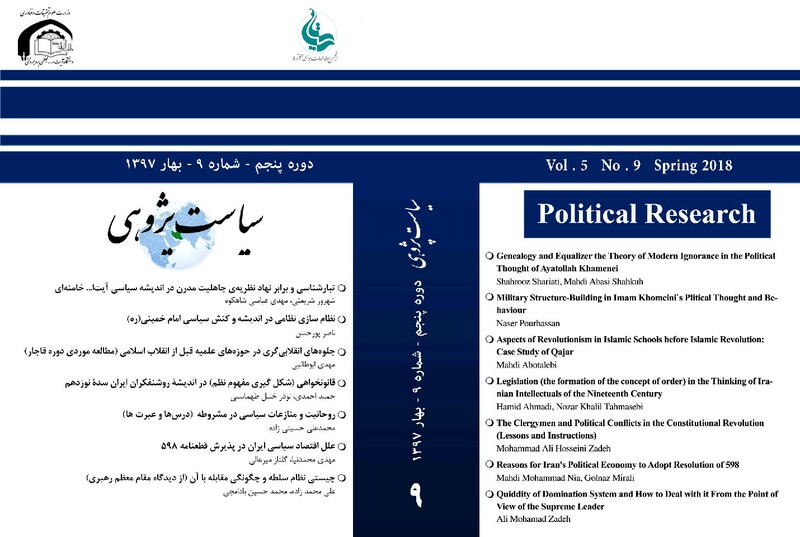 Thus, the central idea of the research is that understanding the political thought of Iran in the nineteenth century, especially the trend of thinkers to law and the establishment of order, Is subordinated to understanding of the time of intellectuals and the dominant discourse on Iranian society in the 19th century. A time that was influenced by the inner challenges and miseries and familiarity with the Western world, created questions in the minds of Iranian intellectuals that backwardness was the focal point of these questions and they intelligently summed up the most appropriate answer to the lack of law.